Names and email addresses are not harvested from this feature. We respect your privacy and as such you will not be added to an email list. Many Americans have been led to believe that Senator Joseph McCarthy was a loathsome bully who misused the power of his office to unleash a reign of terror against innocent individuals. But many of McCarthy's Senate colleagues — like millions of his other contemporaries — held the senator in much higher esteem. Senator McCarthy was an advocate of Americanism and a foe of everything smacking of un-Americanism. Just as he served in the Armed Forces during World War II with courage and patriotism, so did he serve his country for more than 10 years in the United States Senate with ability and distinction. Senator Joe McCarthy was not the first and, I pray, will not be the last to warn of the dangers to our society that are inherent in the philosophy of peaceful coexistence with the followers of Marx, Lenin, Stalin, and Khrushchev. Although Joe McCarthy has gone, the danger to our Nation and the free world remains. 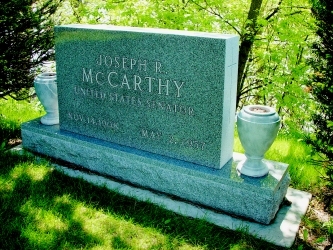 While Senator McCarthy fought fiercely and to the bitter end for any cause in which he believed, he was still a kindly and deeply religious man. All of us owe Joe McCarthy a great debt of gratitude for the fact that he did help us focus, through a considerable period of time, the attention of a great many Americans, and the attention of people in many other countries of the world, to the fact that Communism is here and needs to be destroyed and cannot be ignored, and that Communism must be fought with different types of rules than can be used in fighting against the ordinary type of conspiracy or the ordinary type of criminal groups which seek to destroy America. It has been said here that he was not the first to call the country's attention to the dangers of the Communist conspiracy … but no one warned and alerted the people of this country more effectively than did Joe McCarthy during the time he had the opportunity to guide the Committee on Government Operations and the subcommittee thereof, the Permanent Investigating Subcommittee. I admired Joe McCarthy because of his courage. He was a man of courage. No enemy can ever say otherwise. I admired him … for his independence. He was not a rubber stamp. He would call attention to the evils or to the things which were wrong in his own party, just as quickly as he would point it out if the error was being made by a member of the Democratic Party. I admired him, too, because he had deep convictions. He did not change his mind easily. Once be became convinced, he fought for his convictions. It is my conviction that had it not been for Joseph McCarthy's unrelenting campaign against this international conspiracy, communism would be in a far stronger position in this country today. If Senator Joseph McCarthy had been a petty or a vengeful man, he could have used the vote of censure to tear the Senate of the United States into bitter factions. But he understood the Communist mentality too well. He knew that was what they wanted, and what they expected. He would not injure the Senate of the United States, to get a little personal revenge. Once the vote was cast, he asked nothing of his supporters. He turned a smiling, friendly face to his traducers. No man in public life has been more shamefully maligned. For the first time in our history, I believe, the meanness of his enemies pursued a man beyond the grave. To millions who mourn his death, Joe McCarthy's life and works need no vindication and no justification before the bar of ultimate justice and the throne of his God. His heart was pure; his purpose was noble. I know I have not been alone in reflecting upon what might have been done to ward off the unhappy event which climaxed Senator McCarthy's crusade against communism. Here was a man who was hated and vilified, not for his faults, but for his virtues. Nevertheless, he insisted on standing the savage ordeal alone. He did not want his friends to be tarred and feathered by the brush that was being prepared for him. I have often wondered whether I would have done what Joe McCarthy did. I have some doubt about it. I think in moments I would have quailed. I am afraid that in moments when the load became so heavy and the fury so great, I might have faltered. He did not falter under any attack. He did not falter under any assault of character which was made upon him, day after day. He had the courage to withstand the attacks. He excelled in the human attributes of loyalty and devotion to his country, and had the courage to express and articulate his devotion in everyday life. Do not mourn Joe McCarthy. Be thankful that he lived, at the right time, and according to the talents vested in him by his Maker. Be grateful, too, that when it came his time to die, he passed on with the full assurance that, because he lived, America is a brighter, safer, more vigilant land today. 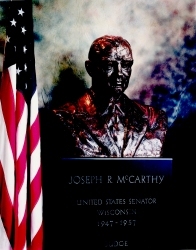 All quotations in this column appear in a book entitled Joseph Raymond McCarthy, Late a Senator From Wisconsin, Memorial Addresses Delivered in Congress, published by the U.S. government printing office in 1957.